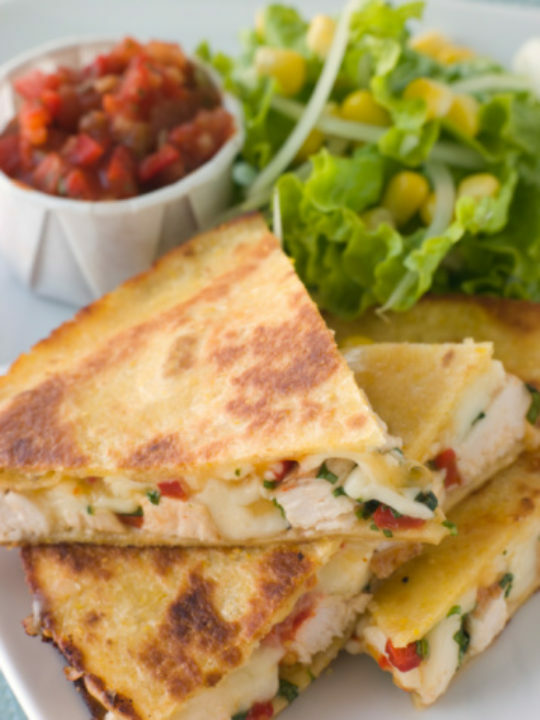 These apple chicken quesadillas are an amazing variation on a Mexican favorite. Try our quesadillas (with heart-healthy guacamole) and que sera, sera! In a bowl, combine the first 8 ingredients. Place about 3/4 cup on half of each tortilla. Fold tortilla in half over filling and secure with toothpicks. Bake for 8–10 minutes or until golden brown. Carefully turn quesadillas over; bake 5–8 minutes longer or until golden. Cut each quesadilla into three wedges; top with lettuce, salsa and sour cream.